The North Country Underground Railroad Historical Association (NCUGRHA) researches, preserves and interprets the history of the Underground Railroad, slavery and abolition along the Upper Hudson River-Champlain and Canal-Lake Champlain corridor of northeast New York. Visit the North Star Underground Railroad Museum where exhibits and videos reveal hidden success stories and our bus tours revisit underground escape routes. Our museum is a reflection of the importance of human freedom and its relevance for the present and future generations. Sold for a little slave oh then, for that poor mother pray! 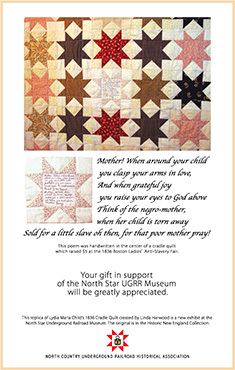 A replica of the 1836 Cradle Quilt, on which the above poem was handwritten in the center, is now on display at the North Star Underground Railroad Museum. Your gift in support of the North Star UGRR Museum will be greatly appreciated. A free African-American born in Minerva, New York, to a freed slave and a free woman of color. 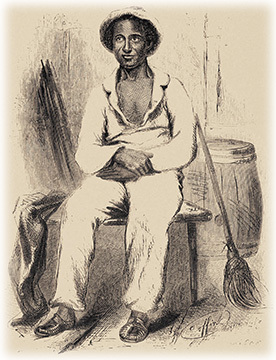 In 1841, Northup was kidnapped and sold into slavery. He spent 12 years as a slave before being rescued with the aid of Canadian carpenter, Samuel Bass; Henry B. Northup, lawyer and son of the former master who had freed Solomon's father; and New York State Governor Washington Hunt. Northup wrote his memoir, Twelve Years a Slave, shortly after regaining his freedom. 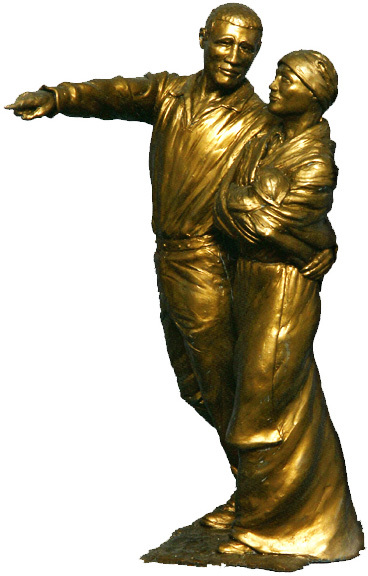 Solomon's story inspired the 2013 Oscar-winning film, 12 Years a Slave. Co-founder of the National Association for the Advancement of Colored People (NAACP) and leader of the Niagara Movement. Donate or join NCUGRHA today! Our logo unites two Underground Railroad symbols—the North Star and a Lantern. The North Star was the light in the night sky which guided enslaved Americans to freedom in the 19th century. A burning lantern was a sign that they had arrived at a safe house. Our logo represents the eternal quest of the enslaved of the world to be free. The North Star Underground Railroad Museum is closed for the season, but can be opened for tours by appointment. 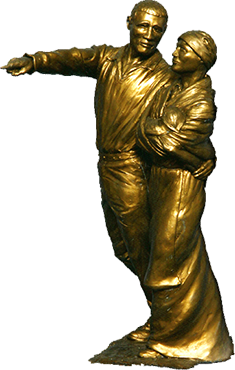 Visit the Museum page for days and hours. Join the fun and become a docent at the North Star Underground Railroad Museum.